How do you find death? a young buck, at the edge of flight, nervously paused. Suddenly his gaze met mine. I froze my breath and squeezed the trigger. And in an instant, I took its life. A loud invasive retort shattered the quiet boreal sunrise. In an instant the deer’s path ended. I had winter meat secured. Quietly, I approach the dead deer. I am shocked at how abruptly death pushes beauty aside. followed by a stronger-voiced thanks. pull my gaze skyward up through the latticework of birch and spruce. 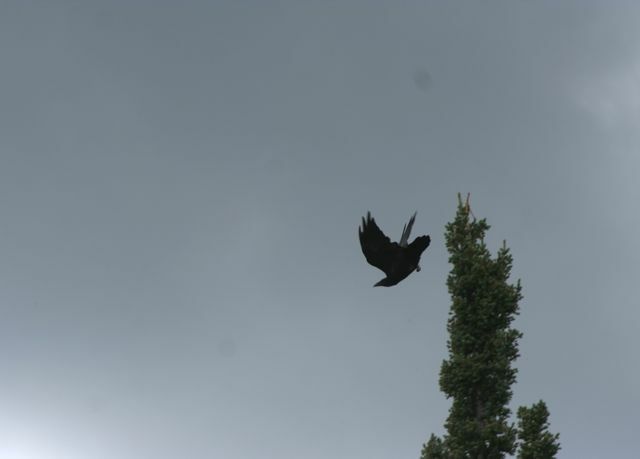 A raven twists in flight as only ravens can. And for a moment the gaze of the hunter and scavenger meet. Is this a deliverance of condolences on the raven’s wing beats? Does the passing raven in its undertaker plumage, carry away the buck’s heartbeat? Yet, it was the unfamiliar corvid call, not the lazy flight that gave me pause. This was no perfunctory deep-throated croak. Nor was it a liquid gurgle or rattling staccato. The foreign call, easily heard, was a more tamed and measured outburst. Or maybe your notes are simply a careful raven pronouncement of found-food? your brisk arrival begs astonishment. Was it the explosive rifle that called you to breakfast on this chilly morning? Did you scent the freshly dead on boreal updrafts? Perhaps your keen vision picks up images unseen by my feeble-eyed genus? into the thickets of November clouds. Patience black one. I’ll be gone shortly. Let me unzip and release this deer’s furnace and heat. These spilled hot, wet organs and globs of creamy fat will be your prizes. The red heart and liver are mine and will fry nicely with big-yolked eggs. pulling my hefty prize towards a distant kitchen. you can slip in and taste the promise of another tomorrow. it is likely I will return next November. I will slowly climb into my spruce perch. and wait for the whisper of deer steps. bearing witness of your odd, woeful lament. “Doesn’t an old thing know when a new thing comes? 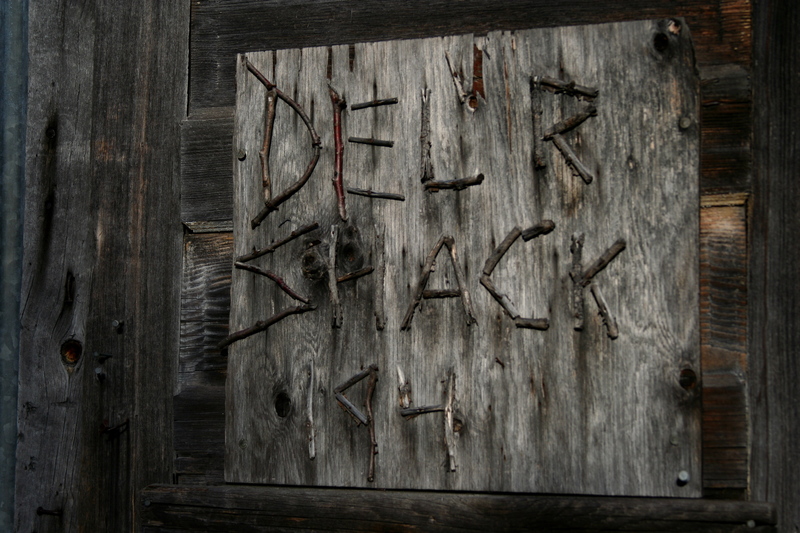 Seventy-two years ago, the old deer shack was built. One of the builders is still alive but otherwise change has been an absolute. The beloved deer shack resides far from modern conveniences somewhere in the northeastern arrowhead region of Minnesota. Returning there each November is like pilgrimage to a hunter-gatherer spa. It is a library of sorts steeped in rich oral history, humor, hunting tips and mistakes and even memoirs. Soaked into the uninsulated plank walls are years and years of spoken stories. Some, like a tight pine knot, will remain fixed and never be loosened again. And others are repeated annually like a familiar squeak in the floor. Mostly the shack hearkens to a time when things were simpler and quieter. Chores practiced seventy-two years ago are still carried out today. The rusted rod from a stove pipe damper serves as a door closure and lock is pulled from the door hasp. And the screech of the ancient door pulled open rouses our spirits like a child’s Christmas Eve. There are buckets of water to fetch up the winding trail through the alders from the river’s edge. The pair of old wooden benches are placed on each side of the handmade wooden table with the checkerboard carved on it’s top. The lantern is hung high from the S-shaped wire and candles are fitted into the necks of old bottles on the table. Firewood is carried in and stacked against the wall in the corner. Kindling is split and a fire is laid in the old wood burning stove welded from 1/4inch thick, eighteen inch wide piece of pipeline. A match is struck and steered to the edge of a scrap of frayed birch bark. With a sputter and crackle, the fire leaps and we are formally returned to a sacred place where for a few November days each year men become boys. To experience such quietude far from any televisions, radios, telephones, humming appliances and highways in the 21st century is a rare privilege. With the passing of each year it is becoming more and more difficult to avoid the prattle of modern conveniences. Alas, in recent years, even the primitive shack has become tainted with modernity. With the advent of pocket-sized cell phones, the unrefined essence of the shack is threatened. A year ago, 2011 my wife Nancy, and I succumbed to family pressure and bought our first cell phone. We did not buy any phone plan. Instead, we bought the most basic model where you simply purchase minutes. I still hardly know how to use it and I have no fervent desire to read the manual. And to this day it is usually tucked in a kitchen drawer with the phone books. I confess I love my slender laptop computer but for me, a cell phone, while sometimes a convenient aid, is mostly an obtrusive technological mosquito that is largely pesky. I have feelings about where and when cell phones should be used. For safety reasons, I don’t think they should ever be used ever while driving a vehicle. And I find it rude when I’m having a live conversation with someone and then they take a phone call interrupting our chat. And its simply wrong to be standing at a urinal next to a guy in a public restroom and he is absorbed in his texting. And then there is the addictive nature of texting. I lost my texting virginity less than a week ago, when I sent my very first text on a friend’s phone. Oh it was indeed a bit magical, but when finished there were no fireworks or post-texting bliss. But for the first time, texting reared its invasive head at the deer shack. Suddenly our brotherhood conversations were diminished when one of the guys had his head bowed, as if in prayer, over his texting machine. A year ago I received an email message from my oldest daughter that included a foreign word typed in before her closing. I likely frowned in puzzlement when I read: “LOL!” But then I smiled because I thought, of course, “Lots of Love!” It was a day or so later that I learned this was part of a texting lexicon and that the true translation was “laughing out loud.” And now I have come to learn that there is a newly evolved short-cut language. In a society that is intent on hurrying to nowhere, it is no surprise that we make up a code that hurries a conversation. So it seems that I am clearly out of touch. I am a flaming romantic who pines for the old ways. I often wish I could be a mountain man of the 19th century roaming the western wilderness on a savvy mule loaded with fur and only a little gear. What would noteworthy mountain men like Jedidiah Smith, Jim Bridger or John Colter, think of such nonsense. As a rebellious act, I responded to some news with an email to my adult daughters and their husbands with my own mountain man texting. I can’t wait to send them another mountain man texting message. When they ask for directions my response will be: “RHTY” Or “Reckon halfway to yonder.” Or try this one when you have to sign off because you need to eat: TCTH. It translates to: “This child’s got a turrible hunger!” In fact I might have to publish an e-book on this language that marries the old with the new. After our stint at the deer shack, I found the courage to cast out a motion to ban phone texting inside the deer shack. And yes, I sent the motion to the floor via email. I suggested that if necessary, texting folks can step outside the old deer shack and huddle pathetically in small groups like praying monks. Or they can go sit in a pick up cab like a grounded thirteen-year-old kid. But inside the deer shack I want real conversation, live joke telling, the hiss of a lantern and the crackling of a stove fire. I am adamantly lobbying for the observation age rather than the information age. Imagine if hunters did away with another information gathering money-gouger, the trail camera. Instead, they might use powers of actual observation and hone their skills in reading deer sign as found in real time under the open air. Imagine if folks didn’t find it necessary to text each other about what they just ate. And do I really have to know that a buddy is up in their tree stand and just saw a weasel? Sure I want to know but let’s pull our chairs close to the wood stove later and spill out days stories. Within hours, there were responses to my appeal. “Why we don’t simply go back to sleeping on straw ticks in the deer shack?” Or, “Let’s get rid of all the synthetic active wear clothing and go back to wool.” Hmmmmm. . .well not an altogether bad idea. Of course it all comes down to choices. How much change do we accept? I started to think further on the issue. That means that rather than hang a lightweight portable deer stand, we have to find a tree with appropriate limbs to climb and then sit on or uncomfortably stand on. And forget those handwarmer packets that contain a mixture of iron powder, charcoal, salt, sawdust and vermiculite and miraculously generate heat when exposed to oxygen. Yikes! I might have to make exceptions with those conveniences we embrace. Based on the response thus far, I’ve not yet received a second motion to bring the vote to the old plank floor.